2018 was a truly monumental year for cannabis. The marijuana industry was valued at about $10.4 billion and is expected to only grow exponentially from there. By the end of last year, two more states (Michigan and Vermont) legalized cannabis for recreational use, bringing the total to 10 states and Washington, D.C. that allow for recreational marijuana. With the addition of Missouri, Oklahoma, and Utah, a total of 33 states now legalizes medical marijuana use. The new farm bill, which passed with a huge amount of support from the House and Senate, legalized the growth of industrial hemp. Even beyond legislation, societal attitudes surrounding cannabis are changing drastically. While marijuana still isn’t legal on a federal level, the societal support for it is huge. According to a Gallup poll from last year, about 66 percent of Americans believe cannabis should be legal. An online Harris poll found that a massive 85 percent of Americans believed that marijuana should be legal for medical use, many of whom also believed medical marijuana could play a vital role in the growing opioid crisis. With all that in mind, we thought we’d conduct our own study to get up close and personal with the general public’s attitudes and knowledge surrounding cannabis and the trend toward societal acceptance. Why Did We Conduct A Study on Cannabis Attitudes? We wanted to look deeper into the social attitudes surrounding cannabis use and figure out if they still prevailed today, and that’s where our study comes in. The goal of the study was to expose some of the biases and misconceptions about cannabis. We also wanted to see what people actually knew about cannabis, from cannabinoids to general effects. Healthy Hemp Oil is dedicated to educating and informing while reporting the latest updates from scientific and medical research. We wanted to know what people’s perceptions on cannabis were outside of legality. We wanted to know what people were thinking in order to expose the truth all over the U.S. The good news is that a lot has changed since then, and if our study is any indication, we’re heading in a good direction. 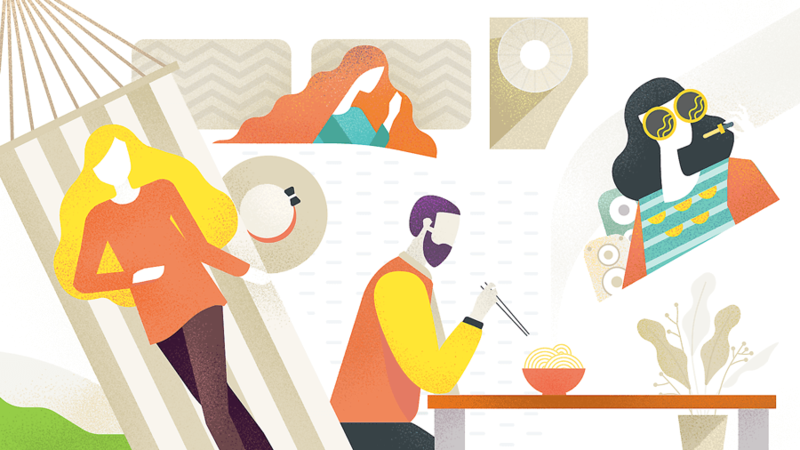 We conducted this survey with help from Survata, an independent research firm from San Francisco. The responses to questions with multiple choice answers were randomized to eliminate response order bias. We had 454 total respondents from across the Survata publisher network. Respondents were men and women over the age of 18 living in the United States. Of our respondents, 57 percent came from states that had not legalized cannabis for recreational use. About 45 percent came from a state that legalized medicinal use of marijuana. About 61 percent of respondents believed that cannabis should be made legal for recreational use. Here’s what we learned from our study. 40% of people had a more positive attitude towards marijuana. Now that some states have legalized the use of medical marijuana, about 40 percent of respondents had a generally more positive view of it. 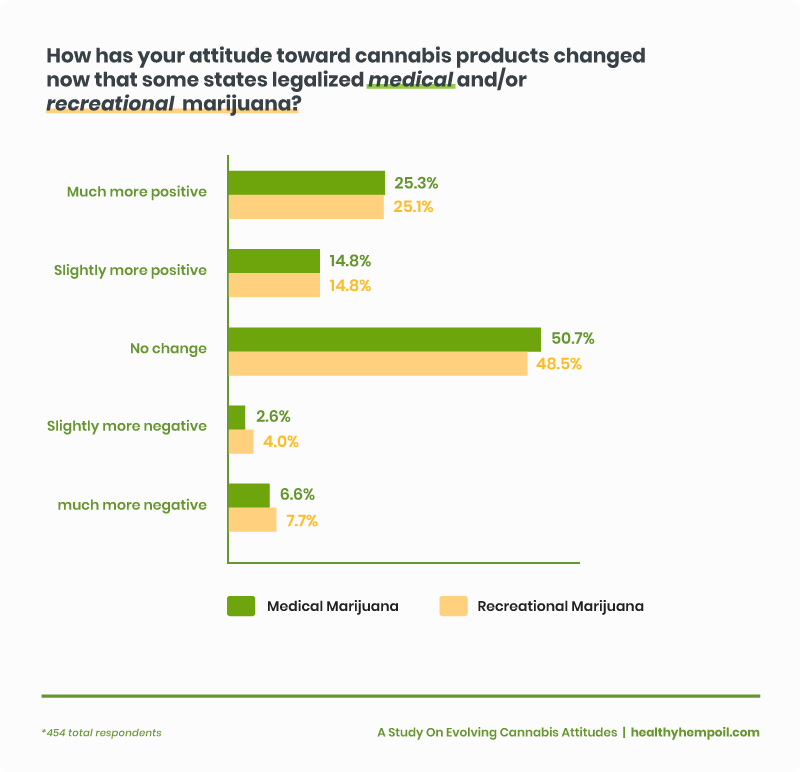 The legalization of recreational marijuana also had about 40 percent of respondents show a more positive attitude toward it. Cannabis is associated with relaxation, hunger, joy, and sleepiness. Our respondents associated cannabis with a variety of effects. The majority (just over 53 percent) associated cannabis usage with relaxation. Much of this comes from CBD, which has been shown to promote physical relaxation in the muscles, but THC has also been shown to help relax mental strain. A little over 47 percent associated cannabis usage with hunger, which has been proven in several studies. Mouse studies have found that THC activates the neurons in the hypothalamus. Instead of creating the chemical that signals physical fullness, THC causes neurons to tell the hypothalamus that you are hungry, even if you just ate, driving your natural hunger. Earlier studies also found that cannabis affects the cannabinoid receptors in your olfactory bulb. This results in food smells and tastes becoming exponentially more intense, which can also affect the amount that you eat. Happiness, giggles and feeling uplifted are associated with cannabis. 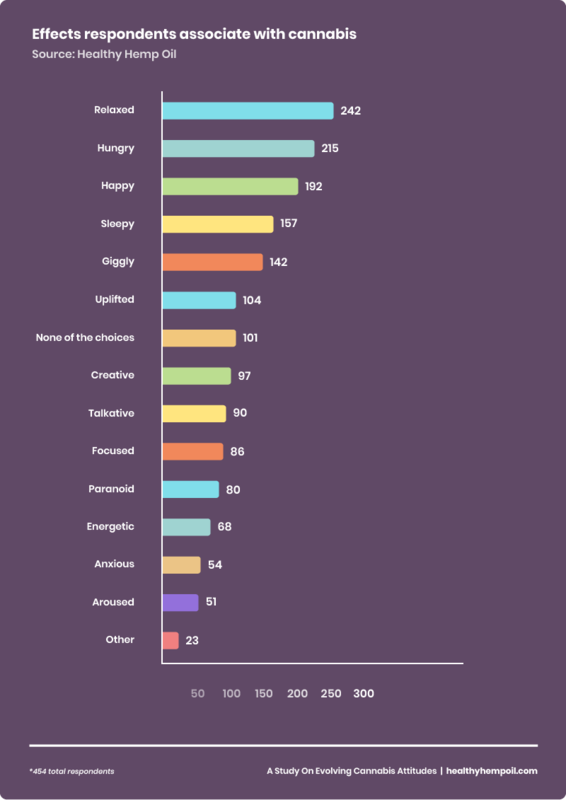 A good amount of respondents associated cannabis with general euphoria or joy. About 42 percent of respondents associated cannabis usage with feelings of happiness, 31.3 percent associated it with feeling giggly, and 23 percent associated cannabis with feeling uplifted. Studies do suggest that cannabis has the potential to produce general feelings of euphoria. While some people believe this comes from its interaction with dopamine receptors, some studies suggest that cannabis (specifically THC) binds to receptors for anandamide. Anandamide is known as the bliss molecule, promoting the joy, happiness, and euphoria associated with cannabis. Anandamide also plays a role in memory, appetite, movement, and the formation of nerve cells. Cannabis is also associated with sleepiness. About 35 percent also associated cannabis use with sleepiness, which is another widely studied claim. Some studies show that THC acts to induce sleep. CBN is also useful for sleep as it possesses a characteristic sedative effect, which may contribute to more restful sleeping. Some studies suggest that using cannabis may also improve sleep quality by reducing REM sleep, which is the sleep phase wherein you have dreams. Theoretically, spending less time in the REM phase means more time spent in the deep sleep phase, which is considered to be the more restorative, restful phase in your sleep cycle. Although REM is still important to your sleep and overall health, these studies could suggest that cannabis usage could help to promote better sleep habits and quality. It should be noted that the effects of cannabis can vary from person to person. While it may induce sleepiness in some, it may keep others awake or they may not be affected at all. 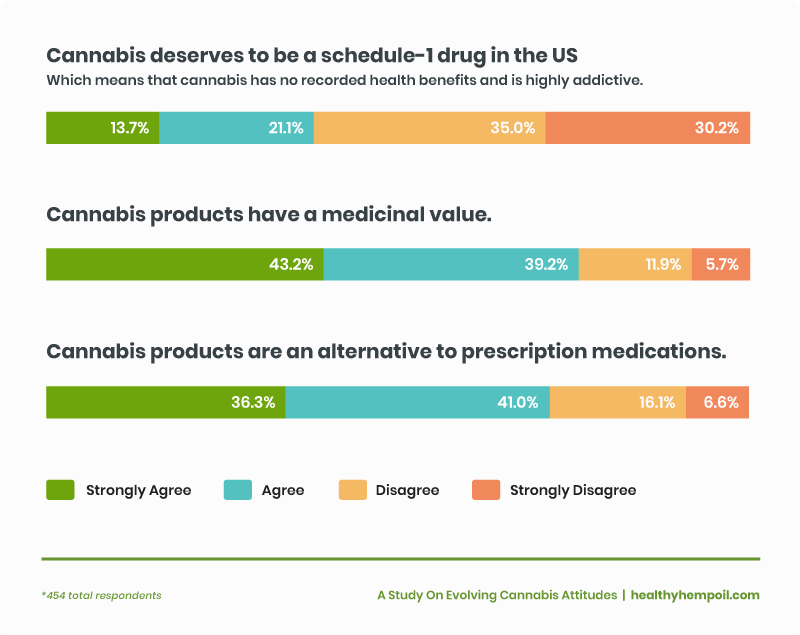 65% of respondents believe cannabis should not be a schedule 1 drug. Schedule 2 drugs include cocaine and meth. 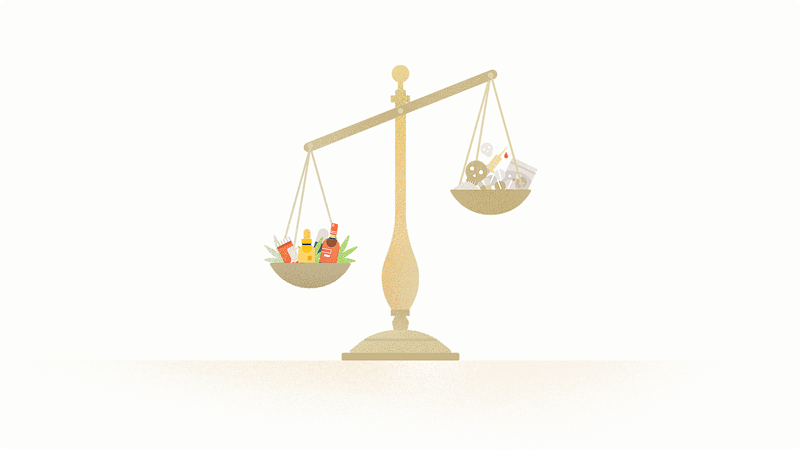 While the law regards cannabis as more harmful than cocaine or meth, schedule 2 drugs are considered to have just as high of a potential for abuse as schedule 1 drugs but may present some medical value. If anything, this just shows how arbitrary the system is and how stigmas have had a very real impact on government legislation and classification. 65.2 percent of respondents believed that cannabis should not be categorized as a schedule 1 drug. That means that a vast majority of respondents were against the classification and the drawbacks it comes with. Cannabis’ classification as a schedule 1 drug places stronger restrictions on it, which ultimately means harsher criminal penalties for usage, cultivation, or ownership. Schedule 1 classifications can also potentially interfere with state laws and taxes, bank loans for businesses, and even de-licensing for doctors who prescribe medical marijuana. Removing marijuana as a schedule 1 drug would be a huge step in supporting new businesses, state decriminalization, and preventing punishments for those who actually need medical marijuana for therapy. Over 86% of people support medical marijuana. Cannabis has most often been praised for its potential medical and therapeutic applications, and most of our respondents agreed. Over 82 percent of our respondents believe that cannabis products have some medicinal value. More than 77 percent believe that cannabis products could be used as an alternative to prescription medications. Overall, 86.3 percent of our respondents believed that medical marijuana should be legalized for medicinal use. Most were unswayed by a political candidate’s stance on cannabis. 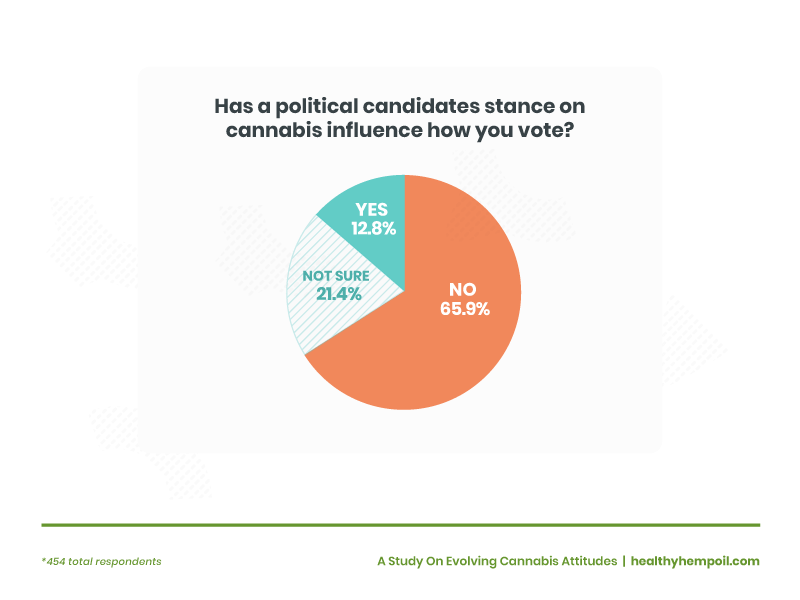 Nearly 66 percent of our respondents stated that a political candidate’s stance on cannabis has not influenced how they voted in an election. A mere 12.8 percent of respondents did take into consideration a candidate’s stance on cannabis, while 21.4 percent were not sure either way. Illegal possession of cannabis should come with light punishments, if any at all. About 37 percent of respondents believed that an appropriate punishment for the illegal possession of cannabis would be a fine or ticket. A little over 38 percent believed that it should not come with any punishment at all. About 14 percent believed illegal possession should result in rehabilitation treatment, while about 10 percent believed it should be punished with jail time. Not all respondents were familiar with the compounds in cannabis. Cannabis features a variety of active compounds known as cannabinoids. 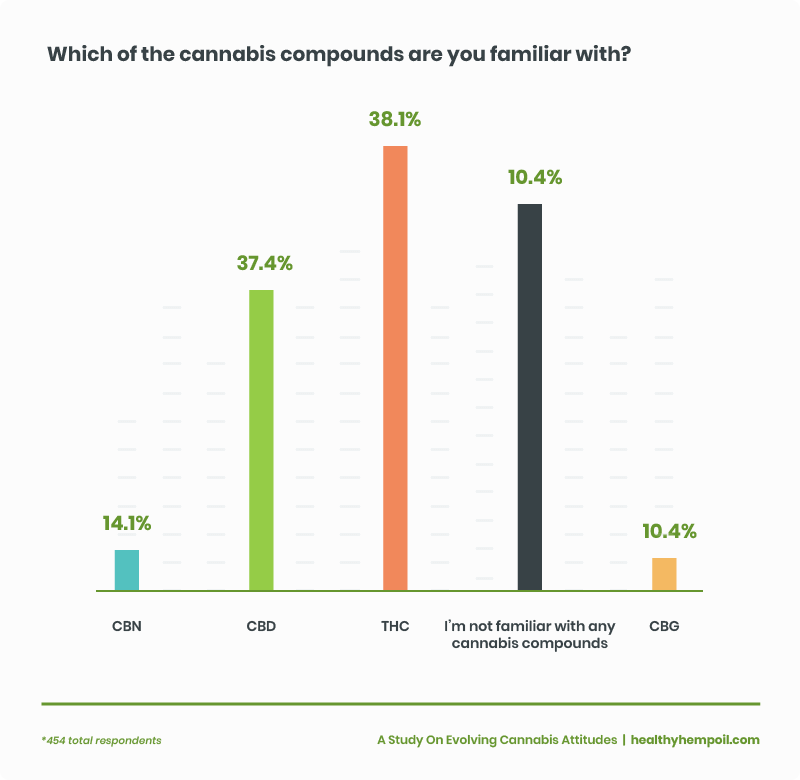 About 49 percent of respondents were familiar with THC, and 33 percent were familiar with CBD. A large group, about 42.5 percent, were not familiar with any of the compounds in cannabis. 52% didn’t know what CBD was. Although 45.4 percent of respondents believed CBD to have medicinal properties, about 52 percent did not know what CBD is. Less than 6 percent of respondents believed CBD is harmful and just gets you high, both of which are disproven. While many know about THC and CBD, even the most experienced of cannabis users are unfamiliar with the drug’s other compounds. 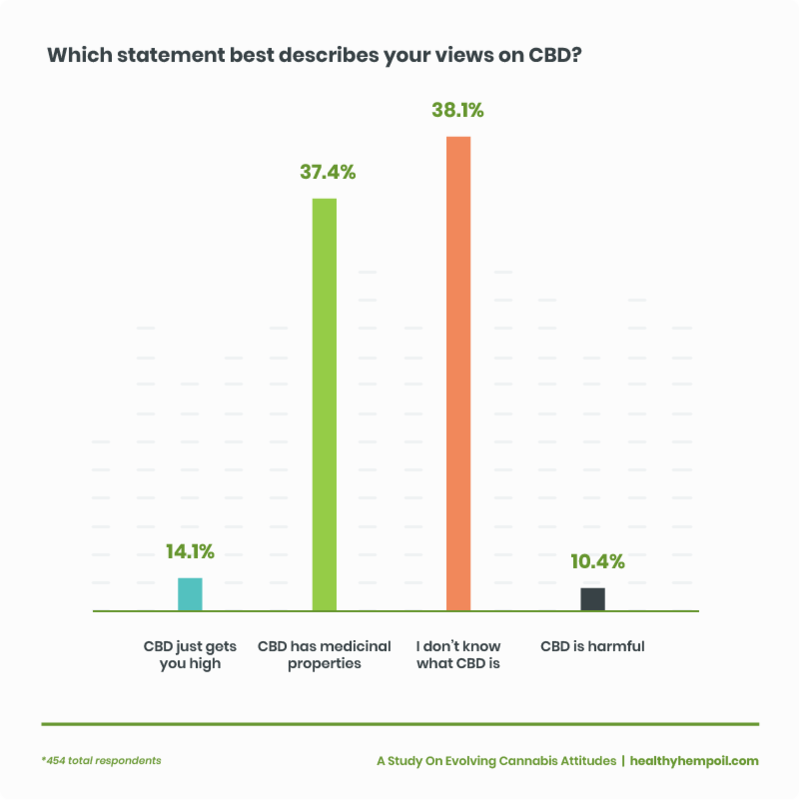 Just 4.4 percent of respondents were familiar with CBN, and 3.5 percent were familiar with CBG. CBD is a non-psychoactive compound found in cannabis that has medicinal properties. THC also has medicinal properties but it is psychoactive. CBN, or cannabinol, is closer in effect to CBD than THC, but it offers a unique set of potential benefits that researchers are still looking to study. CBN is most commonly characterized by its sedative effects, which may contribute to a better night’s sleep. Similar to CBD, CBN does not present any psychoactive effects. CBG, or cannabigerol, is present in low concentrations in most strains of cannabis. Often making up less than 1 percent of the total compound amount in cannabis, CBG is considered a minor cannabinoid. Studies on CBG are still ongoing, but early research suggests that this compound may have more specific physiological effects than other cannabinoids. Some research shows that CBG may be particularly effective in reducing symptoms of glaucoma, decreasing the inflammation in mice with inflammatory bowel disease, and acting as an effective antibacterial. If you read our blog regularly, you probably know that CBD, or cannabidiol, is one of the main cannabinoid compounds in cannabis. CBD does not induce any psychoactive effects. Instead, studies suggest that CBD presents more physical therapeutic benefits. CBD may help to reduce stress, relieve general pain and inflammation, improve sleep quality, and boost mental and physical energy. Cannabis is still illegal in the United States under federal law, but states continue to take big steps toward changing that. Ten states and Washington, D.C., have legalized marijuana for recreational use. Thirty-two states and the District of Columbia have legalized marijuana and cannabis for medical use (though even these approaches vary from state to state). 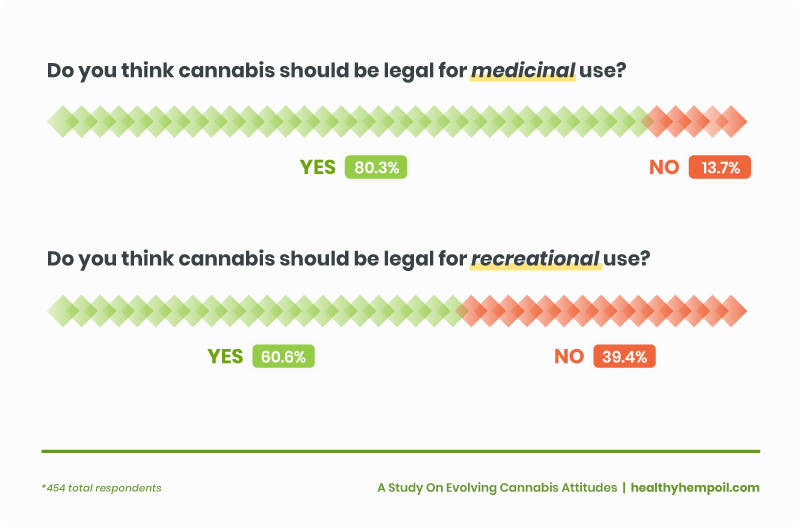 As our survey and other surveys show, the majority of the nation’s population supports legalization of both medical and recreational cannabis use. Much of that comes down to retiring the old attitudes surrounding cannabis, and with growing research and education, more people will rethink these attitudes and understand that cannabis may actually present some benefits for everyone. We were most surprised by how many respondents didn’t know what CBD was, but we hope that we can provide you with plenty of information to help you learn about CBD and cannabis in general. What surprised you? What responses do you agree or disagree with? Let us know in the comments. Health-related Marijuana Dispensaries – What Are The Measures Involved In Opening A Dispensary?